This week's Mid-Week Match-Up is for friend of DT Dan E who tell us that he will be in Europe on an extended vacation/sabbatical for 9 weeks with his small family (wife + kid). In his words: plan is to buy a sweet ride to explore in. I have a friend we are staying with in Switzerland who will buy the car before we arrive and sell it after we leave. Great opportunity to drive something fun I can't or wouldn't get over here. I've always wanted a high HP manual wagon and the 450hp Audi RS4 Avant is at the top of the list. But, I've been scouring the internet and there are some potential concerns with the Audi 4.2L V8. Apparently, the timing chain guides and tensioners can wear out above 75k miles and they are cleverly located on the back of the engine so it has to come out for the $$$ repair. There are also lots of references to need for costly regular cleaning out of carbon deposits in the intake system. Seems like a potentially risky option for reliability and resale value. Anyone know anything about these engines? Another option I'm considering is a BMW 335i or 545i wagon. Lots less HP but could still be fun. I haven't had time to research these yet. What else should we be considering? At our price (<$20k), cars would likely have about 100k miles on them. Any recommendations would be greatly appreciated. 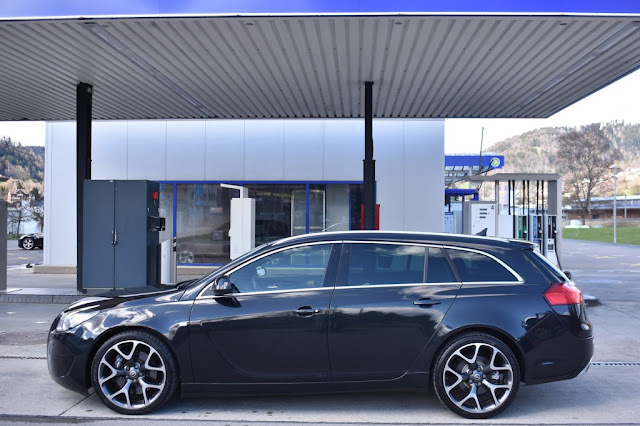 One option is this Opel Insignia Sports Tourer 2.8 Turbo OPC...which around here is called a Buick Regal...but over on that side of the pond is much more manual and wagony. What do you guys suggest for the family guy who wants something for a European experience? Dang, love that Opel wagon! Isn't an Audi RS4 still a $30k+ car over there too? How about an Alfa 156 or 159 Sportwagen? I'd go for a French car if I *really* wanted to sample some forbidden fruit. The German junk over there is just going to be slightly different than the German junk here. French cars haven't been sold here in a generation, nor are there any re-badged French car substitutes, so I'd think it would be something really different than what we get here in the states. I LOVE the OPC version of the OPEL wagon and it would be my first pick, just because I've been waiting for it here (as a Buick) but Gianni's nailed it... gotta go French for a unique experience. If you're looking for a great cruiser with UNIQUE written all over it.. Citroen C6. Don't know how easy it would be for your friend to sell after you're done with it though. What about a diesel stick volvo wagon of some flavor? Alfa 156 or 159 wagon? I bet they are super hard to find. Howabout a bonkers hot hatch? Alfa Romeo 147GTA - 3.2L V6 & 250bhp to play with. Horsepower schmorsepower. Unless all your driving will be on the autobahn back and forth to the Nurburgring. Everywhere else, the all-seeing, all-knowing AI eye will be upon you, soullessly churning out three tickets a day from the same camera you keep passing in an unsigned 30 kph “residential zone” in the middle of an undifferentiated stretch of perfect driving road. Ask me how I now know you’re just supposed to know. Oh yeah, a car. Pick up a fine old Citroen CX or XM — you can get one with a stick — and drive around in style and comfort, to admiring smiles, selfie requests, invites to fondue parties, etc. Sell it for what you paid for it. Insignia might be a good choice when talking about driving. But its rear legroom is terribly small, for a 5 meter long car. Being 5'10'', rides that took more than one hour were truly uncomfortable. If your kid is small enough it doesn't have to be an issue.